It's super simple and integrates Project Tango technology. While Google did not announce the release of a rumored virtual reality headset during the keynote today at its Google I/O developer conference, it did release a design for a new simple-touch remote control for all of Google’s VR content. The remote control designs came bundled with plans for a Samsung Gear-styled VR headset, so while Google’s not making a headset, it does have plans to partner with “several” other companies to manufacture VR headsets and remotes, all planned for release this fall. The remote looks incredibly small and minimal (it’s similar to a Roku or Apple TV remote), unlike the bulky controllers introduced by HTC’s Vive and Facebook’s Oculus VR headset. The remote will have two buttons and a clickable touch pad at the top, but the real innovation happens inside: sensors track movements in virtual reality and allow users to interact with the world around them. “Everyone thinks about headsets, but the controller, how you interact with VR is just as important,” Clay Bavor, Google’s vice president of virtual reality, said on stage. Presumably, much of the sensor technology comes from Google’s Project Tango team, which has been working on technology that allows devices to better understand their place in space relative to the objects around it. There are several specific events around Project Tango this week and more details will likely come out of the conference, which runs through Friday. Google released designs for a VR headset and remote. 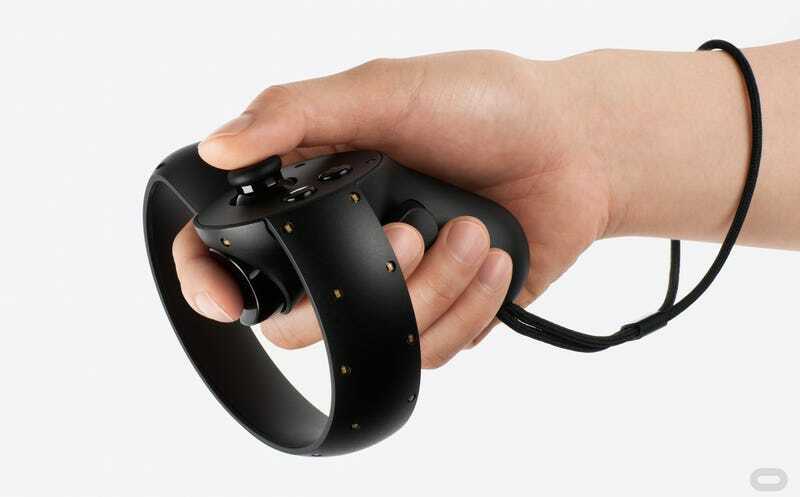 Controllers for the Vive and Oculus look and feel more like video game controllers, and typically require sensor towers set up in the room to track movement, but Google showed none of those sensors during the keynote. It’s unclear if users would be able to move around the room with this controller and headset combo, but it’s certainly capable of more interaction than Google Cardboard’s singular button. A demo video showed how a user’s arm could select a video to watch in Google’s new Google Play VR store, control the motions of a virtual dragon, flip digital pancakes, go fishing, and flick a magic wand to knock down targets. Millions of people are used to this sort of motion-based control thanks to the popularity of the Nintendo’s Wii, but Google seems to think this controller can be the universal controller for the future virtual world. Also on Wednesday, Google announced a VR platform called Daydream, which will house all the apps for Google’s future VR content and company reps talked a lot about how YouTube is being rebuilt to support VR videos. Android N, Google’s next major update for its mobile operating system, will also include hardware and software support for virtual reality capabilities. Bavor said Google is partnering with “several” manufacturers to deliver VR headsets and controllers later this year, with the first arriving in the fall. But the big question remains — how much is all this going to cost?